A card or a tie seems to be the only traditional Fathers Day gifts. There is no safe fall back gift if you have no idea what to get your dad. Sometimes it can be hard to find the right gift or find the one that shows how you feel. Other times it is just nice to find something that is unusual and fun to give. Here are some unusual Fathers Day gifts for dads of all ages. Please note that I am listing the website that I found them on and the price listed on it. I am in no way connected to these websites and I am sure these items can be found in retail stores or other online shops. 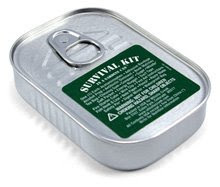 Survival Kit in a Sardine Can. This is great for the guys who like to camping, fishing, hunting, hiking, or long road trips. It made me think of my Step Dad who works in the woods as a forest ranger, but I think other people will like it just because it is so odd but useful. It is an actual sardine can filled with 25 survival items: non-aspirin pain reliever, adhesive bandage, alcohol prep pad, antibiotic ointment, book of matches, compass, chewing gum, sugar, salt, energy nugget, duct tape, fire starter cube, first aid instructions, fish hook & line, note paper, pencil, razor blade, safety pin, reflective signal surface, tea bag, waterproof bag, whistle, and wire clip. I found this at http://www.thinkgeek.com/ for $12.99. USB Memory Watch. This is for the guy who has to be connected all the time, or just likes spy gadgets. 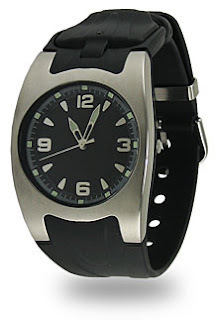 It is a watch that can be used to store 2 GB or 4 GB of data. I like this because it can be useful, you don’t need to carry around a disk or something, just upload info, MP3 files, pictures, or whatever into your watch. There is less chance of forgetting it or loosing it, which I tend to do. On top of that it actually is a nice looking watch. For an external data storage and watch the price was pretty good. I found this at http://www.thinkgeek.com/ for $34.99 and $54.99. Working Wood Siege Tower. This is for those guys who love castles, knights, and siege weapons. This is a little siege tower is a 1/18th scale replica of a 13th century war engine. It actually shoots a clay ball over 10 feet. It is a kit so it has to be made, but that is half the fun. 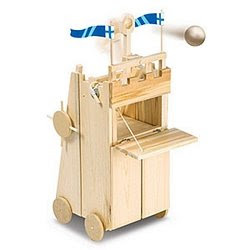 I actually know quite a few men who would love to spend an afternoon building siege towers and then using them to battle each other, or at lest see who’s is the best or shoots the furthest. I know they built catapults out of Popsicle sticks and spent the afternoon trying to be the one to hit the most targets in a cardboard castle. I have a list of people for this one, even if it was designed for age 9 and up. The kit comes with rolling wheels; lowering drawbridge and firing catapult and includes some modeling clay for projectiles. Requires scissors and white glue. I found this at http://www.x-tremegeek.com/ for $39.95. I can think of the trouble I would get into with this on my desk. Just picture it, low cubical walls all around, “Where did that come from!” would be the cry. 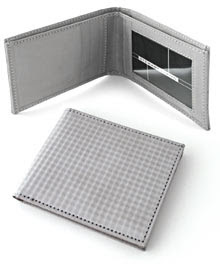 Stainless Steel Wallet. I know that wallets are not that unusual, but this one is. It has the texture of silk but is actually woven from micro fibers of stainless steel. It makes me think of the duct tape wallet that was so popular a few years ago. I found this at http://www.thinkgeek.com/ for $79.99. 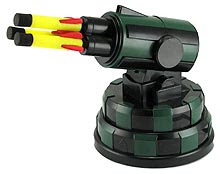 USB Rocket Launcher. My husband has this one on top of his wish list for Fathers Day gifts. He loves it because you operate it using your computer. I think this is the gift our 5 year old is going to give him. I will never get the two of them off the computer with this. They will play with this for hours and never get tired. Though I did see one with a web camera that lets you see what you are aiming at. 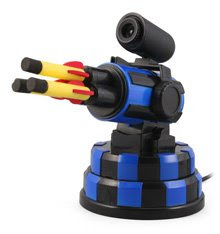 It is the USB Webcam Rocket Launcher will shoot up to 15 feet. If two people have them then they can take over each other’s remotely and fire on each other. Sound like a lot of fun. I found both of these on http://www.thinkgeek.com/ for $29.99 and $59.99. Blog on Father's Day celebration ideas and coloring sheet. Those are really cool tips. I hope you could share more ideas on gifts.